Here is an in depth Strength and Conditioning Program for youth football athletes. Strength and conditioning drills has always been a large part of what players utilize to prepare for a football season. There is now so much more available compared to past decades where the focus was placed on barbells, free weights, and nautilus equipment. Advances in knowledge and technology have allowed for the size, strength, and speed of athletes at virtually every position group to be at all-time highs. Athletes today look very different from their early counterparts. How Do College and Professional Athletes Become So Much Bigger, Faster, and Stronger? Football is a sport that requires a great deal of time and dedication. There are many factors that go into looking like the players that you see on TV. Genetics plays a large role. What we have inherited from our parents is essentially “set in stone”. But fret not, you don’t have to be 6’8” to excel in football. Diet is another key factor that helps optimize an athlete’s performance. A left tackle that is 6’6” tall and weighs in at 320lbs, likely does not have the same diet as the kicker. Furthermore, Tony Gonzalez altered his diet later in his career to a primarily plant based one. As a young athlete, there is no special plan you need to follow. Your favorite athlete didn’t have a special diet when he was 10. Simply maintaining a balanced diet and ensuring you have enough fuel for activity is what is important. Football players spend countless hours, especially in the offseason, training to help better their physical performance. They sprint, jog, jump, lift free-weights and kettle bells, throw medicine balls, flip tires, push cars, drag sleds…the list goes on. If I Shouldn’t Train Like a Pro, How Should I Train? Youth athletes are still growing. Their muscles and bones, as well as the tendons and ligaments that hold them together, have not reached maturity. Resistance training, if supervised and done properly, can be safe. However, it is not necessary, nor is any type of strength program typical in kids younger than high school age. Perform each exercise for 20 – 45 seconds, depending on skill level, in succession. Rest for 30 seconds – 2 minutes after each cycle through the circuit. Repeat circuit 2-5 times through, 2-3 days each week, resting a full day between each. 1.High knees are performed by jogging in place and driving each knee up towards the chest. Remember to use a reciprocal arm swing as you do during a sprint. 2.Push-ups can easily be altered based on your skill level. Performing them against a wall, then on a bench or stairs, then on your knees, and finally in the traditional manner, is a great way to progress. Push-ups are the ultimate full body workout. Push-ups work on arms, abs and your lower body, all at the same time. They train your muscles to work together and become stronger. The push-up is something that doesn’t require any type of equipment or gym environment. The athlete can do them in his room after home is done! Strengthens arms, abs and your lower body. Helps develop balance and stability by strengthening core. Body should be straight from the heels to the crown of the head (plank position). Hands directly below the shoulders. Touch chest to the floor, then push yourself back up to the plank position. Elbows are in tight in the bottom position of the push-up, almost squeezing the rib cage. 3.Mountain climbers are performed by starting in the traditional push-up position, and alternating driving each foot forward towards your hands. Again, this can be adjusted by elevating your hands on a chair until comfortable performing on the ground. 4.Dynamic Pull Ups require a sturdy pull-up bar or monkey bars. If one repetition cannot be completed, simply hang with your head as close to above the bar as possible can help build strength. The Pull Up is one of the most effective strength and conditioning movements that can be done in a weight room. When you combine its effectiveness with the minimal equipment needed and even less teaching time the pull-up ranks clearly should be one of the most used exercises by all teams in the offseason. What holds people back from using the pull up as an staple lift is that most kids can not complete three sets of 6 or more pull ups. This is where the Dynamic Pull Up comes into play. Before we dive into the techniques of the dynamic pull up let’s start by looking at what makes the pull up such an effective lift. The pull up is to the pulling muscles what the push up is to the pushing muscle. This is a multi joint movement that develops full body strength. While the pushup focuses on the chest and triceps the pull up puts more focus on the shoulder and fully develops the back and biceps. The effect is that an athlete who is able to do multiple sets of pull ups has the muscle to withstand the wear and tear that a season of hitting puts on the shoulders. The Dynamic Pull Up makes for such an effective lift because it allows all athletes to complete their sets. A set of Dynamic Pull Ups starts with a number that each athlete needs to reach, a solid starting number is 5. The athlete will start with a traditional pull up and complete the lift with a full range of motion. They will complete as many reps as they can on their own. When the athlete can not complete another rep they will switch into the dynamic portion of the lift. This is where the athlete will start on the ground and jump up to complete the pull up. By jumping up to start the lift, the body is given the extra momentum it needs to complete the set and the athlete is able to complete all of the reps in the sets. The best part of the Dynamic Pull Up is its ability to take the athlete to the edge of what they are able to accomplish. They take their rep total to failure and at the point of failure they are able to provide the support that allows them to complete the exercise. As they continue to work on their pull ups they will start doing less dynamic pull ups and more traditional pull ups. With the over abundance of training equipment available in weight rooms today it is very easy to get too complex. At the heart of strength and conditioning training large muscle, multi joint exercises will remain kings. and when it comes to these multi-joint exercises the pull up is the only movement that develops the back and shoulders. By using the Dynamic Pull Up you can push your athletes to continue to develop their strength beyond the traditional point of failure. 5. Tuck jumps are performed by jumping in place and bringing both knees up to your chest. Repeat immediately upon landing. 6.Planks are one of the best exercises for developing core strength. Planks also work hamstrings, glutes, and actually helps improve balance. This exercise can be done at the field during practice or even at home. Get in the push-up position, only put your forearms on the ground. Elbow need to be tucked in, directly under your shoulders. Toes need to the ground. Squeeze your glutes and tighten your abdominal. Keep a straight neck and spine. Your body should be a straight line. Hold that position for 30 seconds (or however long the kids can do). These strength and conditioning exercises represent or more natural way to train young athletes, without the worry of inappropriately stressing growing muscle and bones with heavy weights. Furthermore, it helps develop total body strength and cardiovascular endurance simultaneously. They mimic some of the movements needed on the football field and can be interchangeable with other activities like jumping jacks, short sprints, broad jumps, etc. By Anthony Dugarte, M.D., C.S.C.S. The best overall lift to improve body health for athletes and non-athletes is the parallel squat. No other lift serves to build and develop as many muscles and joints that are crucial for living a healthy life as the squat. It is such a critical lift that most weights coaches say if they were forced to only do one weighted exercise they would pick the squat over any other lift. With that being said the squat has long been a target of different attacks that attempt to tear down the merits of the lift. There are a variety of different arguments that people use to attack the squat including: it is bad for your knees, it is bad for your back, it stunts growth, and it slows athletes down. The only time these arguments hold any validity is when people are squatting using poor technique. Anything done with poor form can cause injuries and the squat is no exception. When teaching young athletes how to squat there are a couple of key coaching points that must be adhered to in order to eliminate injuries and gain the maximum benefit from the exercise. The first principle is that athletes must establish a strong base. The general rule is that they should have their feet roughly wider than shoulder width, but it’s more important they have their feet in a power position. One quick way for players to determine their power position is to have them stomp their feet into the ground. When they stomp into the ground their body will naturally take them to a great power position that fits their biomechanics. One of the biggest concerns is with athletes backs. It’s critical that they keep a bow in their back so that it maintains its flexed, rigid position. This will allow the hamstrings, glutes and quads to engage in the lift instead of putting some of the weight through the back. The best way to teach this to an athlete is to have them take a big breath before they squat. This big breath should fill their lungs and make them stick their chest out. They want to keep this core position throughout the lift. The last major coaching point, although there are countless smaller ones, is to sit back in the squat. This is where the majority of knee problems come from in the squat. When athletes just move the weight down their knees are forced forward which puts stress on the structure of the knee. Instead they need to sit back as if they are sitting down in an imaginary chair. This takes the movement out of the knees and allows the load to stay on the target muscle instead of being transferred through the knee. As they sit back they need to get to below parallel. This is the hardest part of the lift to teach but by using modern technology like videos and pictures you can demonstrate to players where they are and how deep they need to get to. The squat is the king of all athletic development exercises. It serves a crucial role in developing the biomechanics of athletes. Like anything, if it is done with poor technique there is a risk of injury which is why the coach’s role of developing technique before adding weight is so critical. 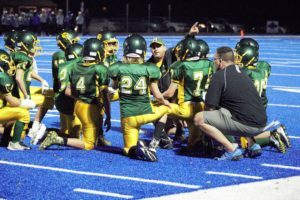 This strength and conditioning program for youth football athletes is simple and can be done at the field or you can even instruct the kids to them at home. All of these conditioning drills are safe for youth athletes. It’s important that coaches/parents monitor their kids as they would with any activity.